Padia K, Douglas TS, Cairncross LL, Baasch RV, Vaughan CL. “Detecting Breast Cancer with a Dual-Modality Device”, Diagnostics, 7(1): 17, 2017. The paper emanated from a collaboration with: lead author Dr Kamila Padia, head of radiology at 2 Military Hospital in Cape Town; Professor Tania Douglas, holder of a research chair in biomedical engineering and innovation at the University of Cape Town; and Dr Lydia Cairncross, consultant surgeon and director of the breast clinic at Groote Schuur Hospital. The CapeRay co-authors included engineering manager, Roland Baasch, and CEO, Kit Vaughan. The article belongs to a Special Issue on Breast Imaging that is being edited by Dr Tanya Moseley, professor of diagnostic radiology with the MD Anderson Cancer Center at the University of Texas. The primary aim was to demonstrate that our second-generation Aceso system could produce improved quality images that provided clinically meaningful results. Utilising two industry standard phantoms, we showed: the FFDM results were better than the European Reference standard of “acceptable” and were approaching “achievable”; and the ABUS results yielded lateral and axial spatial resolutions of 0.5 mm and depth penetration of 80 mm. As illustrated at left (© Diagnostics), we have successfully co-registered the FFDM image in the horizontal plane with the ABUS images in the sagittal (raw data), horizontal (reconstructed) and coronal (reconstructed) planes for a patient with a histologically confirmed invasive ductal carcinoma. 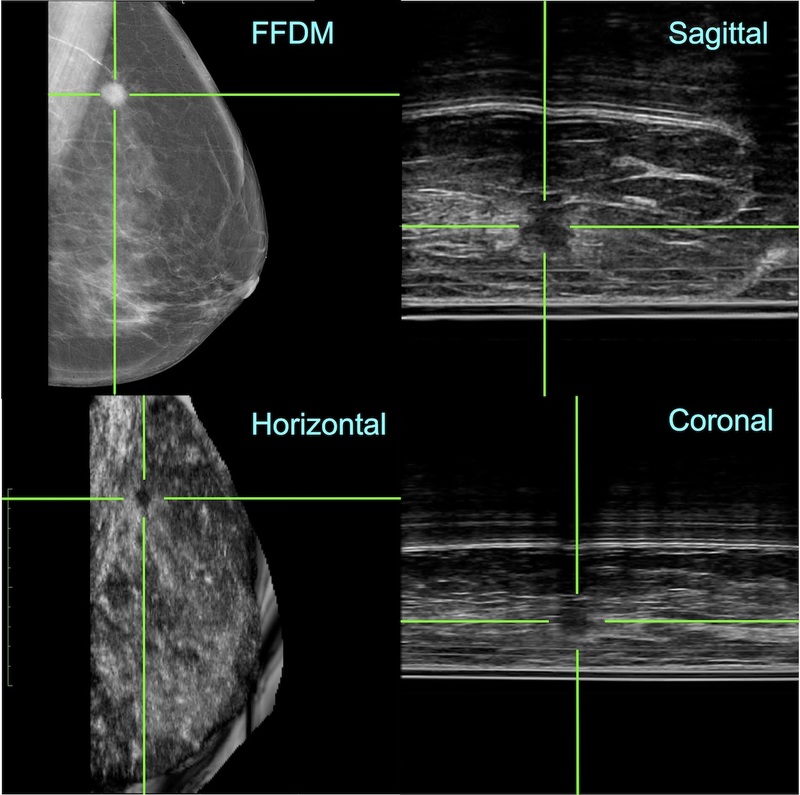 Our article concludes: “Even though FFDM is still regarded as the gold standard for the early detection of breast cancer, it is also recognised that, if a woman has dense breast tissue, lesions may be mammographically occult. The false negative findings can be devastating for the women concerned because a later diagnosis may lead to a poor prognosis and more expensive treatment. We believe that our second-generation Aceso system, with its improved quality FFDM and ABUS images, has demonstrated its potential for the early detection of breast cancer in busy clinics.” Now that’s something worth celebrating!